Win his and hers RooDog eBikes with Auto-Trail. We have teamed up with Auto-Trail and are very pleased to announce that at this Octobers Motorhome and Caravan show at the Birmingham NEC 16th – 21st you could win a pair of our most loved his and hers eBikes. To be in with a chance to win a pair of his and hers RooDog eBikes visit Auto-Trail at stand 7-20. We have had a change of stand and can be found at 8-07. Come along and see us. Have a look at all our eBikes and see how they could be the ideal accessory for your motorhome or caravan. Polka Dot – specially designed for the ladies. Tourer – gorgeous, classic electric bike, step over design. Chic – a small frame low step through super comfy electric bike for both ladies and gents. Mayfair – Elegant and classy mid step through electric bike for ladies and gents. Avatar – Perfect as a robust mountain ebike or as a nippy city ebike also comes in a step through. Striker – Light and robust, the Striker can handle rugged mountain terrain. Revvi – A scaled-down, electric-powered motor bike that has been specifically designed for kids. 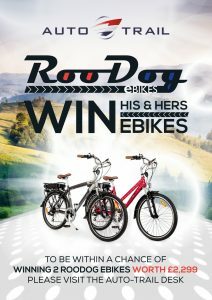 Don’t miss out on this fantastic competition to win his and hers RooDog eBikes. Advance ticket prices £8.50 Senior (Over 60s), £9.50 Adult when booking before 23:59hrs 15/10/2018 after which time prices revert to the on-the-door price of £12.00 Senior and £13.00 Adult. A £1.25 transaction fee applies. Children 15 years and under go free when accompanied by a paying Adult/Senior. Free show guides and towing & manoeuvring tuition are subject to availability. Good luck everybody. Hope to see you there.